TALK TO US. 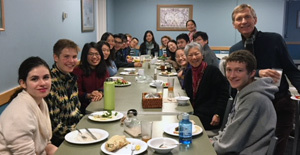 Join any of the language tables Friday, Nov. 16, 6 – 7:30 PM at Mission Park dining for conversation in Arabic, Chinese, French, German, Hebrew, Hindi-Urdu, Italian, Japanese, Korean, Portuguese, Russian, Spanish and Swahili. Learn about our languages, our cultures and our countries, and socialize with us at dinner. Russian Study Abroad meeting, Tuesday, November 6 at Russian Table in Driscoll Lounge from 6 – 7:30 PM. The 11/6 Russian Table will be devoted to questions about study abroad in Russia. Seniors who’ve done study abroad in Petersburg will be there to talk about their experiences. Thinking of Arabic? The Middle East? Come meet current Arabic Studies majors and faculty and learn about studying Arabic at Williams and abroad. Sweet and savory treats will be provided. CLS 2019 Application Now Open! We are pleased to welcome American students to apply for the Critical Language Scholarship (CLS) Program to learn critical foreign languages next summer on a fully-funded study abroad program. The CLS Program is an intensive overseas language and cultural immersion program for American students enrolled at U.S. colleges and universities.